Given the outcome of Sunday's game, I think it'd be good to spend a little time focusing on some of the good things we've seen happening for our team in recent weeks. And the specific good thing I want to talk about is A.J. Derby. Derby is, of course, one of the newest Broncos- having been traded to Denver by the Patriots in exchange for a 2017 5th round draft pick. Fans questioned John Elway's decision a bit, and not unfairly considering that Derby was a 2015 6th round pick who had yet to produce anything. Up to that point, in fact, his career closely mirrored that of an incumbent tight end on the Broncos squad: 2015 3rd round pick Jeff Heuerman. That's when the similarities would end, though. 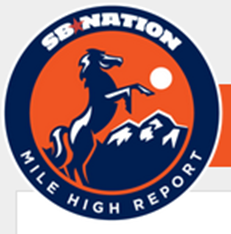 Derby technically made his debut for the Broncos against the Oakland Raiders on November 6th, but his real debut would come to the tune of two catches and 44 snaps in the Broncos' improbable road victory over the Saints. Since the start of that game he's racked up 152 offensive and 20 special teams snaps in four appearances. Moreover, he's picking up steam as he and quarterback Trevor Siemian get comfortable with each other. Two catches in New Orleans became four against Kansas City (and a critical conversion on 3rd & 12 from the Denver 3 yard line) and now five versus Tennessee. In fact, after failing to bring in his first two passes as a Bronco (1 vs the Raiders, & the 1st pass his way vs the Saints), Derby has become Mr. Reliable with twelve consecutive catches. For contrast, Virgil Green is sporting a career-low 58.1% catch rate this season. If you're looking only at the raw stats, you might be tempted to shrug and ask "So what? He's only got 12 receptions for 125 yards and a lost fumble, so what's the big deal?" • Jeff Heuerman: 28 total snaps in the last 4 games. Zero receptions on zero targets. To be fair, he had no receptions in his last 4 games prior to New Orleans either, but he played 63 snaps during those games. • Virgil Green: 2 receptions on 9 targets for 24 yards. Played fewer than 50% of the offensive snaps vs the Titans, which is a first for him in the 2016 season. If you go to the Broncos' team website right now and look at the tight end depth chart, the order is still 1) Green, 2) Heuerman, 3) Derby. Frankly, that's not true. AJ Derby is already the Broncos' undisputed #2 TE and is arguably already the #1 guy in the position group- at least for receiving. At the very least he has already become Trevor Siemian's safety blanket, which is exactly what you want to see for a TE in this offense. Odds are pretty good that after the Patriots game this Sunday, Derby will already have surpassed both Heuerman and Phillips in the total number of snaps taken as a Bronco this season. He won't catch Green in snaps, or even come close... but with three games remaining I'd bet you $100 that he'll surpass Green's season totals in targets, receptions, and yards. 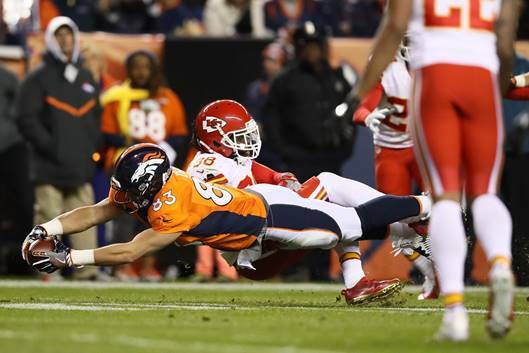 And if another Denver tight end is going to catch a touchdown pass this season (John Phillips caught the only one all the way back in week 3), my money is on Derby for that too. But won't the fumble hurt him? It had better not. Watching the video of that play, I see Derby wrap the ball up with both arms as soon as he recognizes the tacklers' proximity. He fights for it, and had very nearly fought off Williamson when Johnson's hit jarred him just enough for Williamson to rip the ball out. He probably didn't do everything perfectly, but he had the ball in tight and wrapped up with both arms and did not give it up easily. I'm satisfied that him getting stripped will prove to be just an unfortunate outlier. From a longer term view, I'm really excited about what we have in Derby. He's got two more years on his rookie contract, and is perfectly positioned to grow along with our young QB(s). He might already be the most dynamic tight end we've had since Julius Thomas, and I wouldn't be surprised if he becomes the most productive one since JT well before the 2017 season slides into December. Here's hoping he makes his first mark as a redzone threat this Sunday when the Patriots come to town!